The process of disposing of white goods is completely different to that of regular waste removal. 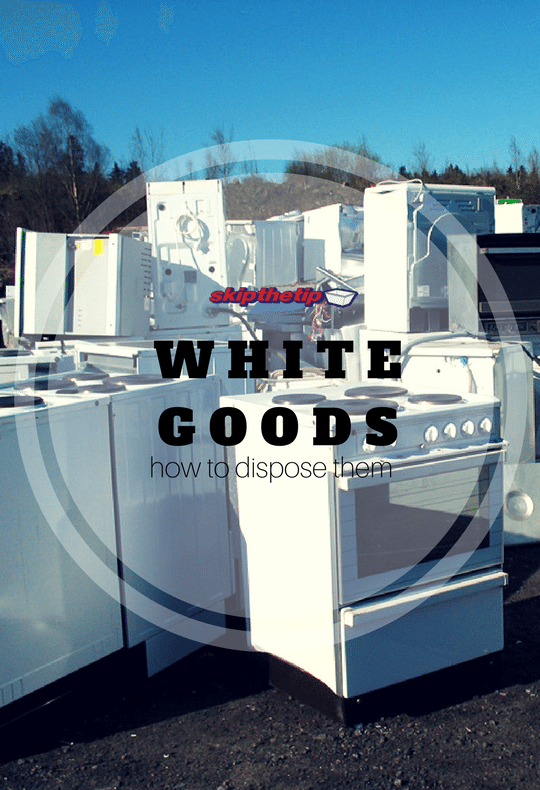 If you want to get rid of a white good from your home, because you may have bought a replacement or it has become defunct, then you need to know how to dispose of it properly. Electrical goods, when they are in the process of being discarded, are referred to as e-waste. Approximately 50 tons of e-waste are being disposed of per year, and this is rising. The UN reports that much of this waste is coming from first world countries and in particular those that are known for their green awareness. A 2013 statistic quoted by the UN states that the waste that could have been recovered or recycled was worth about $52bn, including 300 approximate tons of gold – about 11% of total gold production. And, of course, within this waste are huge amounts of toxins as well – mostly lead, mercury, cadmium and a massive proportion of ozone-harming CFC gasses. From a worldwide point of view – less than 15% of e-waste is properly recycled and over 1/3 comes from large kitchen appliances. A shocking thought. White Goods vs. Brown Goods Pretty Confusing? White Goods – these are classified as such because of the colour they used to come in. They are large electrical appliances and are still considered white goods whether they are in metallic silver or any new fashionable colour. Fridges in the old days used to be coated in white enamel – hence the name. Brown Goods – These are electronic goods other than kitchen and laundry appliances. This term especially applies to entertainment equipment like TVs, stereos, CD players, radios, etc. Unfortunately for you, you cannot and must not put them into a skip bin as you would with regular household rubbish. Hire the services of a professional skip bin company and proceed after a consultation with them. Not so long ago, electrical appliances were regarded as items in our homes that lasted a long time. Today that is not necessarily the case with many goods as we are seeing mass production leading to cheaper electronic appliances, which in turn, are constantly being replaced with newer, better, super-improved, versions. Think of the cell phone and how many times you have replaced yours in the past five years. This to a certain extent is happening amongst white goods. A ‘disposable’ environment is where most of us are now living. Millions of white goods are ending up every year in landfill sites and responsible disposal is something that we all should be doing in order to minimise landfill and help our environment. Yes, there are proper channels for responsible disposal of electronic waste and the recycling of them. Recycling of these goods will help in reducing landfill and resource conservation. Most of all, it will help in reducing the greenhouse gasses used in the production of new materials. These new materials can, in fact, come from recycled resources. The metal recycling industry can strip about 70% of the material from white goods before the remainder is sent to a landfill. A good skip bin company knows how to deal with white goods. There are many metal recycling programs and skip bin professionals work in coordination with them. Your retailer. Ask your retailer if they will remove your old fridge or washing machine when your new improved one is delivered. Be happy to pay for the possible fee that will incur in the delivery charge as this will help you considerably. Make sure they are disposing of these goods properly, as you don’t want to be buying from an irresponsible retailer. Your local council. They will give you advice and they may even collect the item. If not, find out from them where the local resource recovery centre is located and take it there. Second-hand dealers. Check out the second-hand dealers who may pay for used items that can possibly be repaired on resold. Charity organisations. If your fridge or washing machine is still usable, what about giving it to a charity who no doubt will gladly accept it. Metal recyclers. If your goods are not resalable, then they are more than happy to receive them. It all begins at the beginning. This is at the research and buying stage. In order to do this, follow these guidelines when you are in the process of purchasing a new white good for your home. Be conscious of energy and water efficiency in your new white good. The star ratings are there to guide you and your retailer should be able to help you considerably in your choice. The higher the star rating the better efficiencies the appliance will have. They may be slightly more expensive, but in the long run, it will work both to your benefit and the environments. Buy according to your need. If it is not necessary to buy a bigger washing machine, don’t. Brand support. Many brands are designed specifically for recycling. Some of these are Miele, Bosch, Whirlpool, Electrolux. Think sustainability and maintain your appliances. Proper and consistent care will help in the shelve life of your product and ensure proper efficiencies are maximised. Buy products that have good warranties. This will indicate the approximate lifespan of the appliance. Make sure the retailer has a good service system that you can utilise if anything goes wrong. Don’t use a second fridge or freezer that you do not really need anymore. Get rid of it, and your electricity bill will be reduced.